Villas Michalis are very spacious and well equipped to make your stay comfortable and pleasant. The kitchen is fully equipped with all the necessary items such as plates, casseroles, cooking utensils, cutlery etc. There is also a communal washing machine. We provide welcoming hamper including bottled water, bread, fruits, milk, tea, coffee, jam and other seasonal items from our gardens. Everything to make your first day as comfortable as possible. 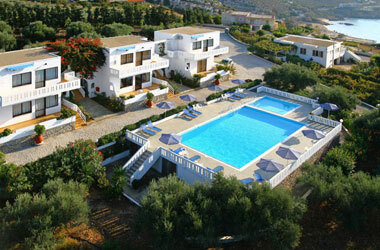 The villas are serviced twice a week which includes clean linen and bathroom towels. For young children we can provide a cot, a high chair and we have many children toys to keep them happy. Arriving at the villa our guests will find food stuff at the fridge such as fruits, wine, beers, coke cola, bottled water, milk, butter, coffee and otheres completely free.